Inmate #29384 considers counting the bars again. SHERIDAN, OR—After spending 73 hours in the Sheridan Federal Correctional Institution in northwestern Oregon, first-time inmate Martin Hayes told reporters today that he was "getting pretty tired of prison." "Man, this is so boring," said Hayes, 38, who just completed day three of a 22-year sentence for vehicular manslaughter and reckless endangerment. "There are no cool activities, no interesting places to go, no nothing. Mostly I just sit around." Though he only arrived at the prison Saturday, Hayes claimed to have already exhausted every idea he had for amusing himself during his 192,852 hours of incarceration. According to prison officials, Hayes has spent the majority of the last two days either pacing his cell, humming tunelessly, or, when no other activity presents itself, masturbating. "Honestly, what am I supposed to do now?" Hayes asked. "Sit-ups? I did those already. And I finished the book I brought in with me, too. At this point, I think I've literally done everything that you can possibly do in this place. How is it only Tuesday?" Hayes then tried to kill some time by doodling, but soon grew bored. After briefly searching for employment with the prison work program, the recently sentenced felon ultimately decided against the idea when he learned that the only position available was some dull, repetitive job making phone calls and persuading people to change their communications provider. "The whole prison is basically just a big building full of rooms," said Hayes, who according to sources has little chance of commuting the two-decade-long sentence that he received for a drunk-driving incident last October. "By the third day you've pretty much seen everything there is to see." On Sunday, his second day in prison, Hayes befriended a small sparrow that had perched on his windowsill, but the bird soon flew away and never returned. Since then, he's kept track of the passing time by watching the progress of shadows cast on the floor by the bars in his cell's window. When skies are overcast, Hayes keeps a running tally of seconds passed by counting them aloud. While his history of prior offenses will likely curry him no favor with the Oregon state parole board, the convict is holding out hope that his cell assignment will change from time to time so that he'll be able to gaze at new patterns of dust on the floor and imagine all the different shapes he can see within them. "I'd go so far as to say this is the most bored I've been in my entire life," Hayes said after rereading the prison library's only copy of Entertainment Weekly, dated September 2006. "Look at this. Am I supposed to care what happened on Grey's Anatomy two seasons ago?" "It's like I'm being punished," Hayes added. Although the Sheridan facility does arrange a few special events for its inmates, including group counseling and a movie night, Hayes has been unimpressed with the calendar of activities so far. "Last night, after they screened We Are Marshall, which I'd seen like three times before, these two guys from Block C started shoving each other and yelling in Spanish," Hayes recounted. "I figured, yeah, this is gonna be cool! Then a guard broke it up. I was like, nice one, buddy. Thanks for ruining the one moment of prison so far that was actually almost fun." As of press time, Hayes claimed to have no plans for the immediate future, expecting only continued monotony. 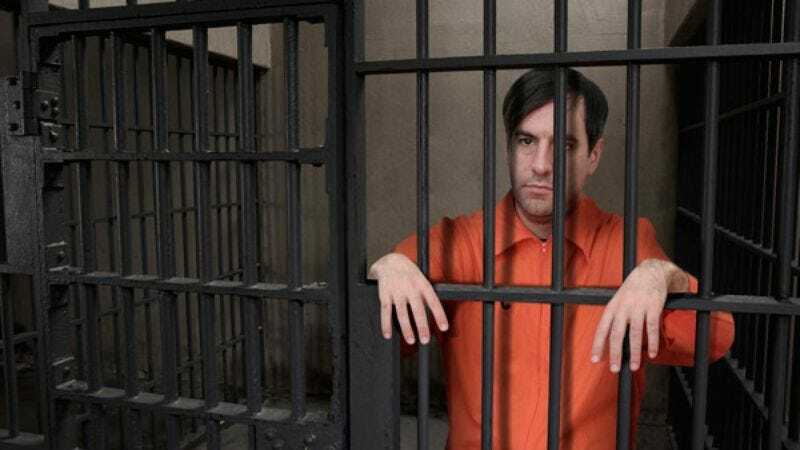 However, fellow inmates indicated the 38-year-old's tedium might soon be dispelled, as tomorrow he will be forcibly tattooed with a mixture of soot and urine, made to swallow six boxes of month-old fermented Juicy Juice, and compelled to shiv a rival gang member to death.